I got to go sailing on one of these today. 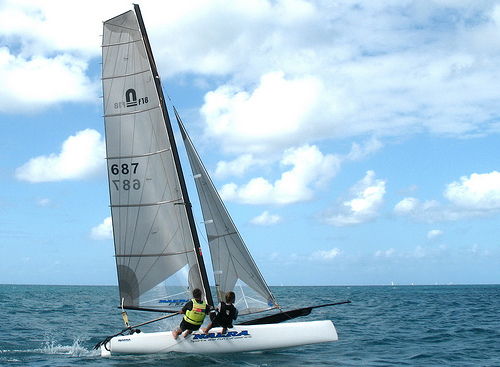 It’s called a Nacra and was originally made in California but is now made in Australia. The photo above is not me… just a picture I found of a similar boat. It was blowing about 20 kn today so it was an interesting and exciting first outing. I got to go out on the “trapeze” which I have never done before. Because you are standing on the side of the boat parallel with the water held up by a cable that goes to the top of the mast your head is about 1 m off of the water and it really feels like you’re flying. Then I got hit by a big wave that momentarily bumped my right knee out of socket. I recovered quickly and was flying again. The owner is out of town until the 18th. Hopefully that will be flying again then.